This year, Fathom events is bringing the Christmas favorite - Miracle on 34th Street - to your local theater. Released in 1947, this perennial favorite features Edmund Gwenn, Natalie Wood, Maureen O'Hara and John Payne. To find our more and see where it's being shown in your area, visit Fathom Events online. When one stops to think of the Thanksgiving holiday in America, on inevitably thinks about The Macy's Thanksgiving Day Parade. That is where our latest entry begins. 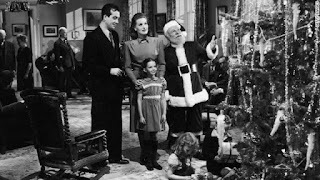 Miracle on 34th street was made by 20th Century Fox and stars Maureen O'Hara, Edmund Gwenn, John Payne and Natalie Wood. 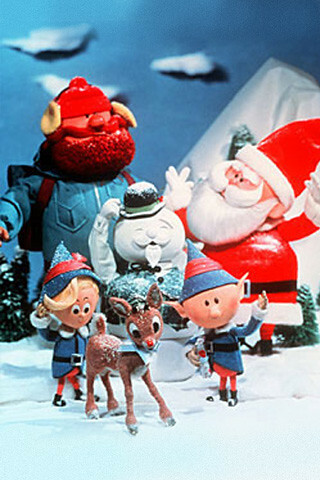 Set surrounding the parade, the story is of a little old man named 'Kris Kringle' who becomes Macy's Santa Claus. Only then do the employees find out that he believes that he really is Santa Claus. The movie was released in May of 1947 due to the fact that Darryl F. Zanuck believed more people went to the movies during the summer. On a trivial note, according to Wikipedia, The Christmas window displays seen in the film were originally made by Steiff for Macy's. Macy's later sold the window displays to FAO Schwartz in New York. FAO Schwartz then sold the windows to the Marshall & Ilsley Bank of Milwaukee, Wisconsin, where they are on display every December in the bank's lobby on North Water Street. Well hi there and welcome to the blog! Next week is July 25th which means it's time for Christmas in July! This year, I've found a gem. Commercials are a big part of our culture and they tend to show off the pulse of the time period. This year, I want to share a collection of commercial breaks from Bing Crosby's final Christmas television special - Bing Crosby's Merrie Olde Christmas. I hope you enjoy this look back to 1977. Do you remember McDonald's gift certificates? You could buy books for $5-10 and give them as gifts. This was kind of neat when I was a kid, but I never seemed to have enough for a full meal [and let's be honest, as kids we all wanted a Big Mac]. Anyway, here's a classic commercial from the 70's. Here's a great live spot for Schick. In the 1970's, The Carpenters were at the height of their success. Richard and Karen Carpenter released A Christmas Portrait in October of 1978 with an ABC special to follow. The previous Christmas, they brought us their first special, The Carpenters at Christmas. The show featured Richard and Karen singing their Christmas favorites and featured guest starts such as Harvey Korman and Kristy McNichol. Christmas Seals were widely popular until the early 80s as a way to raise money for charity. Specifically, for the American Lung Association. Christmas Seal commercials and ads were commonplace in America until this time. Here is a short featuring our boy, Bob Hope from 1944.